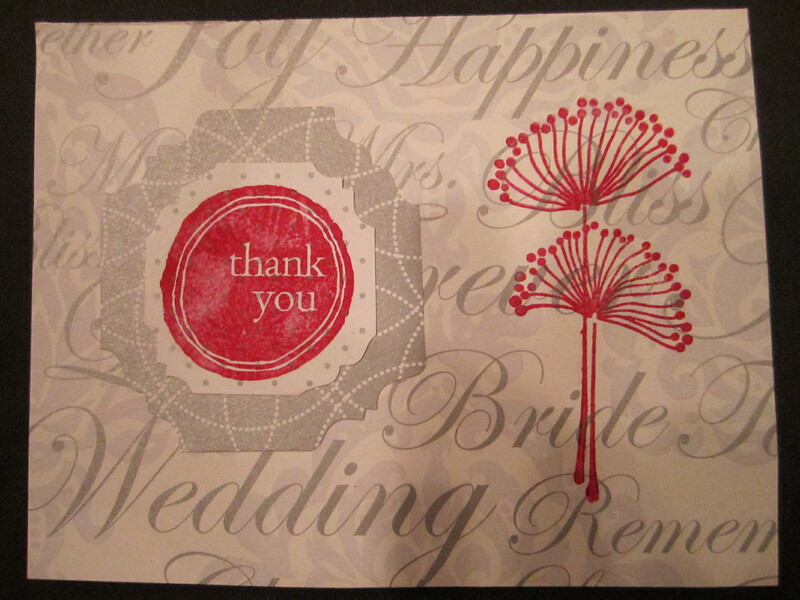 Since majority of my wedding was do it yourself, I thought the thank you cards should be as well. I wanted something cute and very crafty. 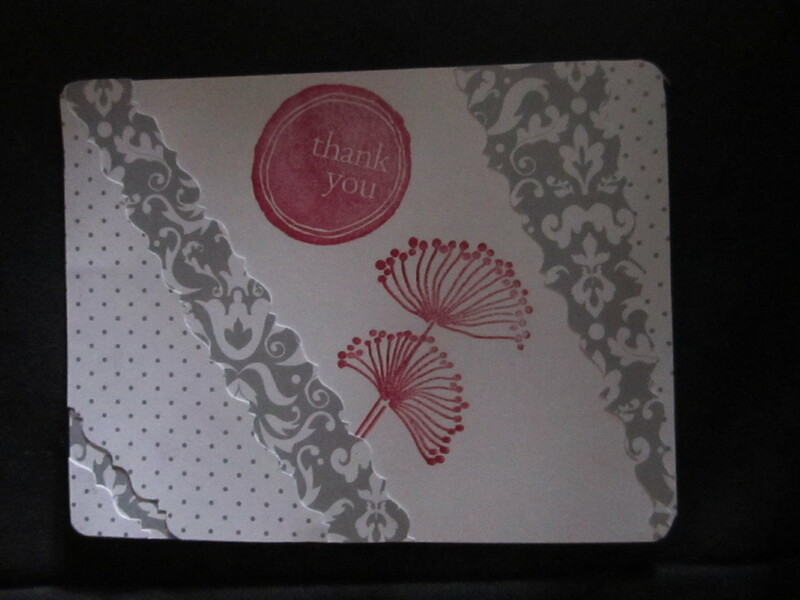 If you look for thank you cards, they can become very expensive. Especially if you were spoiled as my husband & I and receive many gifts, those cards add up. So I decided I’d make my own postcards, so save on paper and postage. What’s so wonderful about this project is it can be used for more than just thank you’s. Everyone loves getting a mail, as long as it isn’t a bill. 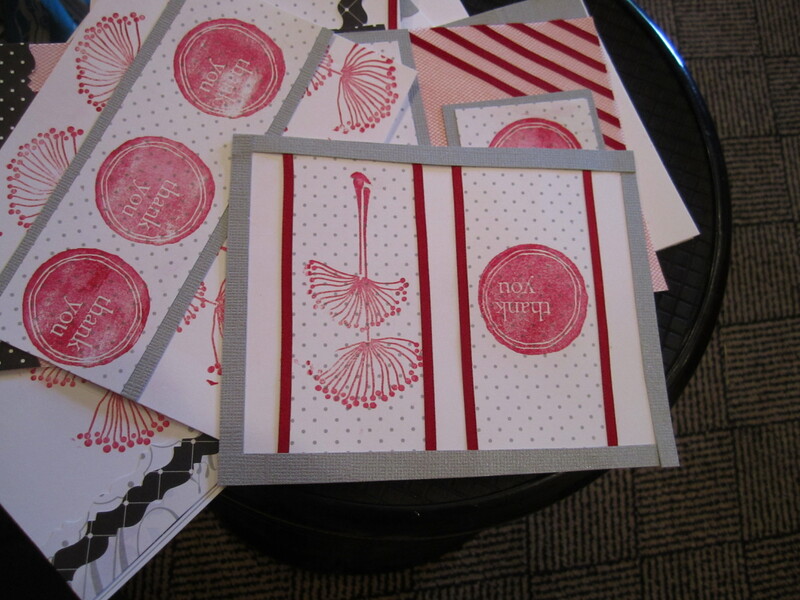 These are great for Birthdays, anniversaries, thinking of you’s, announcements, just because, and so on. You might want to just make up reasons to make these guys! 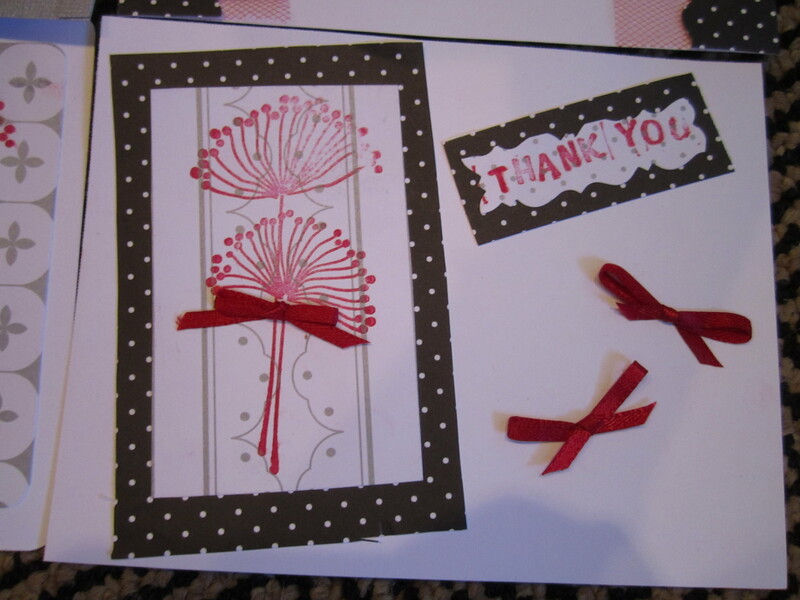 Each one became a personal thank you in design. I thought I’d make a little tutorial on the basic of how I made these suckers. 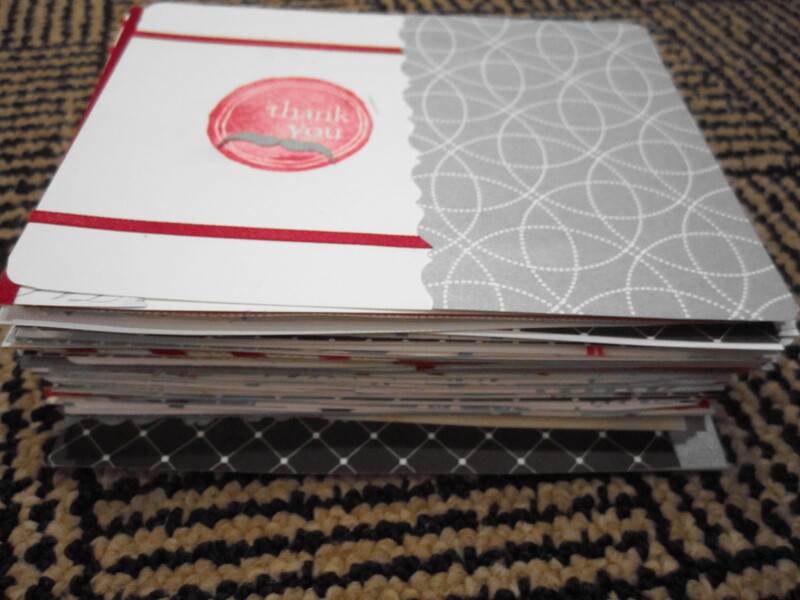 Blank post cards – I bought some 4.25″x5.5 cards on Amazon. Cost me about $15 (with shipping) for 400 cards! I didn’t realize how many I bought until after. 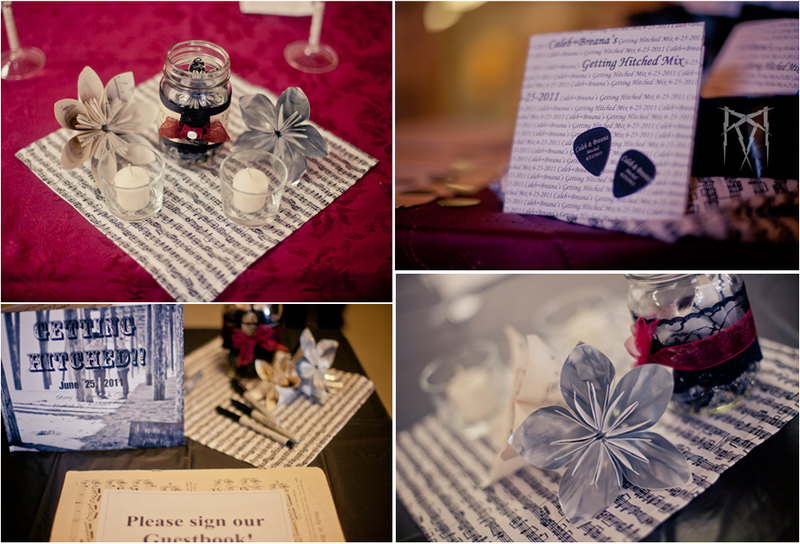 Other options are pictures, cardstock, and index cards. Just make sure they follow the measurement rules for post cards. For USPS this is: Minimum 3.5″x5″ and Maximum 4.25″x6″, with a thickness of .007″- .016″. Other wise, if they are bigger you will be paying more for postage. 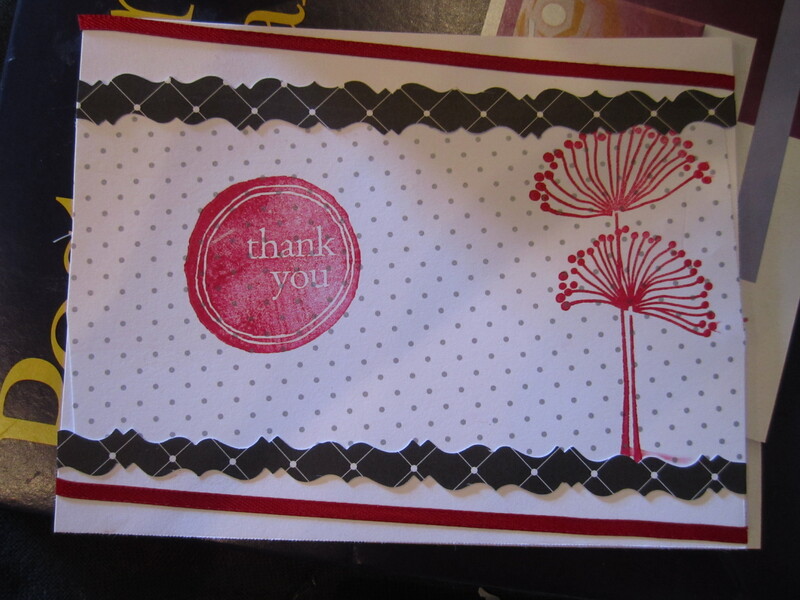 Rubber Stamps – I bought my from Paper Source in Portland. Such a fun selection! Ink pad – or paint if you’re so talented with it. I also bought this at Paper Source. Decorative paper. I got some wedding scrapbooking card stock from Michaels. Glue. I used 2.5 glue sticks for this project. However I recommend a stronger clear glue. Scissors – I had a pair of decorative edge scissors like these: Kraft Scissors and normal kind. Other: Ribbon, Tulle, Fabric, whatever other cool things that’ll glue. Be creative with this. Get your post card out. Stamp it! My advice is to stamp on something hard like a table s urface. I was using books & the box my postcards were in. 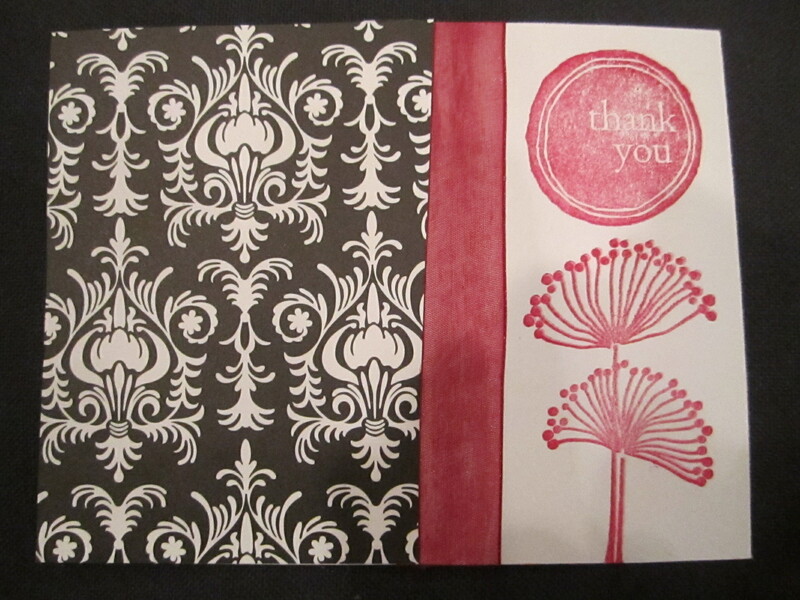 I also stamped the “thank you” on the card as well. Add Decoration. For this one I added first the tulle. I glued the post card itself where the tulle was gonna sit, put the pre-cut tulle over it and used a paper to rub on top to make sure the glue stuck to the tulle. 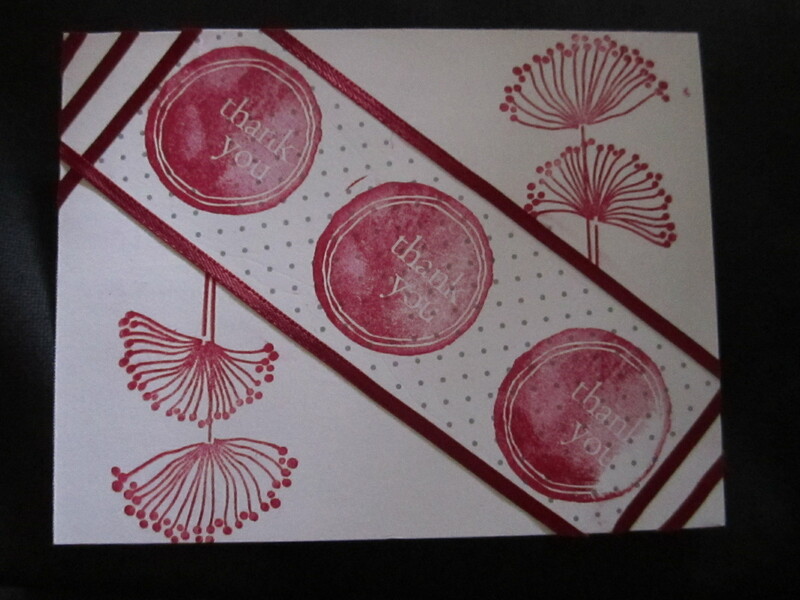 Glue on decorative paper. I pre-cut this paper with my awesome edging scissors. Put the glue on the back of the decorative paper instead of directly on the tulle. Your tulle will otherwise slide around and not participate. Tie a little bow, trim excess ribbon. Now glue that sucker on! 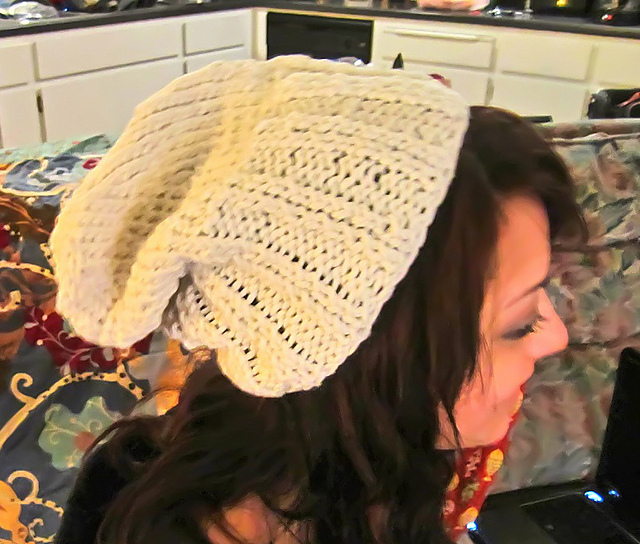 This one, I added an extra strip of decoration on top to add a bit more, pizzazz! There you go! One post card down. I made quite a few, So I guess I’ll show you some of my favorites! 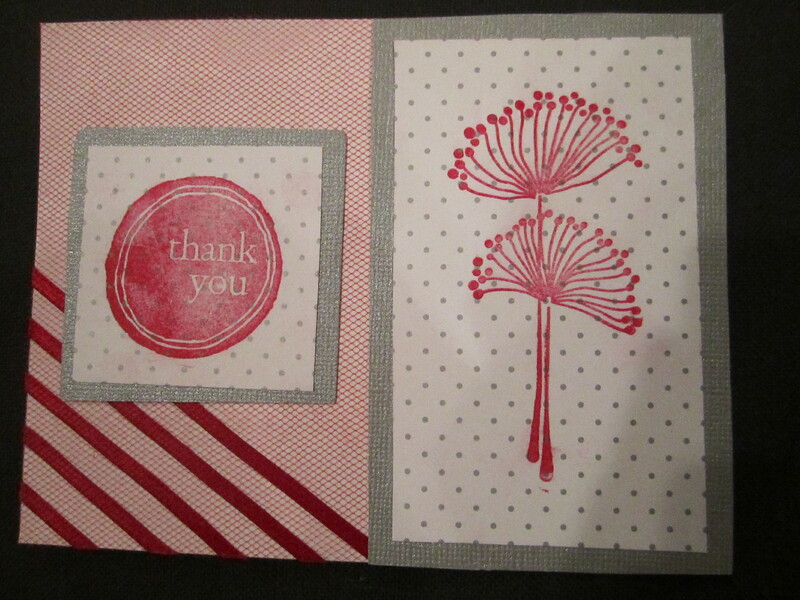 For this one I stamped on a piece of paper first, cut it out, glued it on. Then I cut 2 strips and glued those on, then the ribbon. 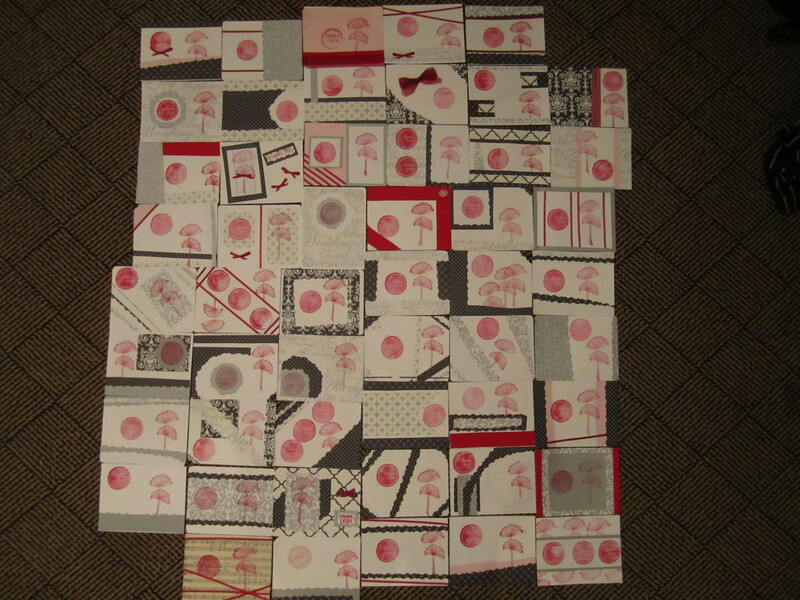 Many times I cut the pieces a little longer than the post card and cut off the excess. Why yes, that little thank you does have a mustache! I used the edge scissors to help create the outline of the mustache, and fixed it with my normal scissors. I first glued on the ribbon, and added the craft paper. For the edges I carefully cute them out with the edge scissors. Click the picture to zoom! 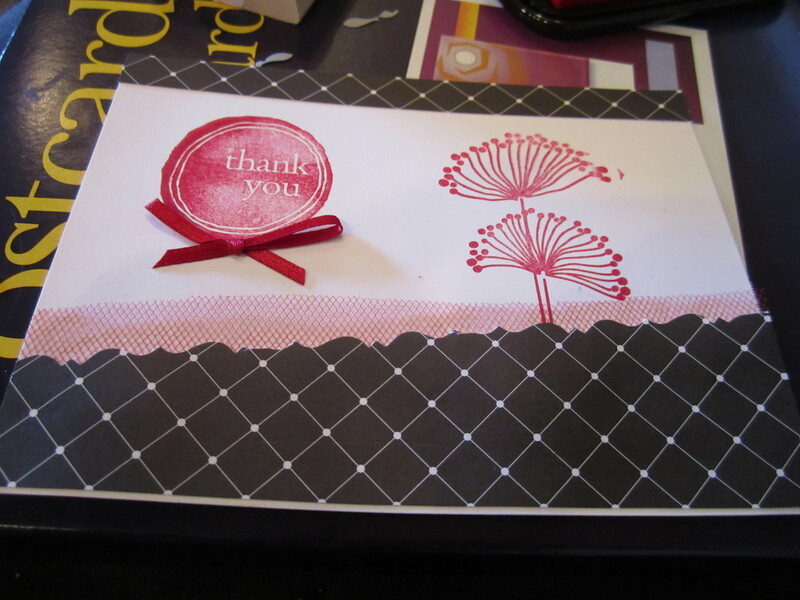 I really enjoyed this craft, and want to look more into making cards also. I’ve seen post card specific rubber stamps to put on the back, and I’m looking into buying a kit for future post cards and make them more authentic. Also a tip, is I bought my postcard stamps online. It was much easier than going to the local post office, and they came in 2 days. If you see a specific one that you want me to explain how I made it, feel free to comment, and I’ll dish all the details. Now to finish filling them out and send them out! Whew. 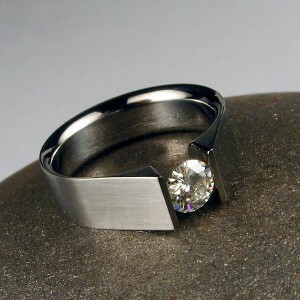 January 1st, 2011 my now husband surprised me with a beautiful hand crafted Moissanite tension set titanium ring. The ring selection didn’t surprise me too much though. He paid close attention to the, ahem, subtle emails I sent him with pictures & links to the ring on etsy. I remember when I first stumbled across ZoeAndDoyle‘s Etsy shop. They had a ring featured on the front page, and my jaw dropped. This thing was so awesome looking. The price wasn’t too bad either. I knew I had to have it for my engagement ring. Caleb tells me he purchased the ring in November and received it in December. He didn’t have any issues with wait time or anything else. Well that’s great to know. 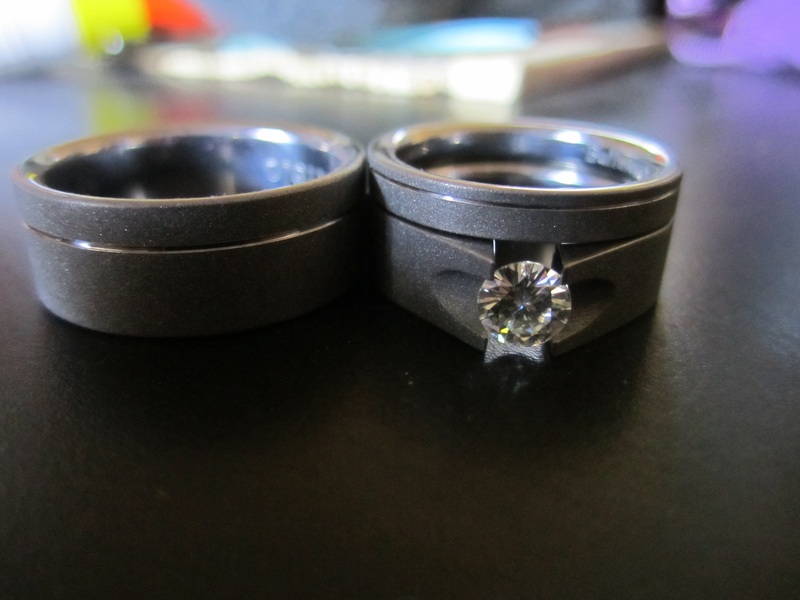 Of course along with that first email, I sent him other emails of another ring by the same shop that I loved. It was the same idea, but brushed coating, and cut-outs/grooves next to the stone. Trust me, so dreamy. Well since these rings were so well priced, and most engagement rings cost atleast double, if not triple of mine, I was allowed to get another one. Now please understand, I’m not a (complete) spoiled brat. The first ring he got me was a little on the snug side. I wanted a ring that fit more properly for when my fingers swell in the summer (and whenever I become pregnant one day.) 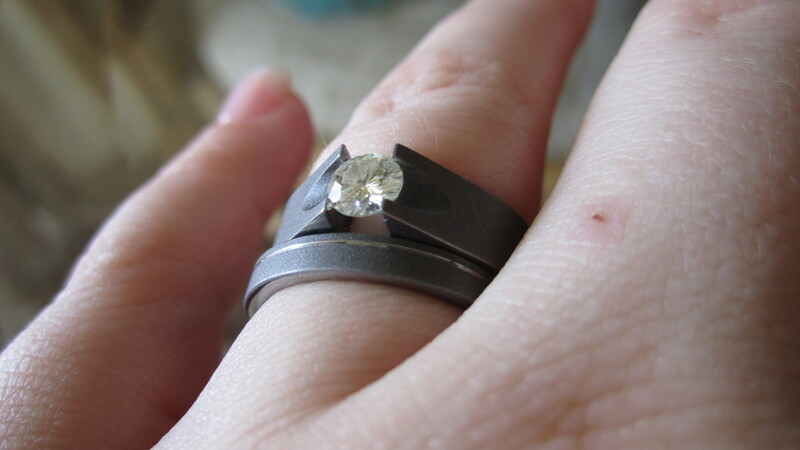 Well I found a design that Caleb loved for our wedding bands. It went well with my other favorite tension ring. We decided to get Buffalo engraved in his band and Buffalo Gal engraved in mine. These are cheesy nicknames we gave each other in the beginning of our relationship. Now, as a warning, some of their feedback isn’t positive. Now, as a relief, majority of the complaints have nothing to do with quality of the rings. It has to do with time frames. This did slightly scare me since we needed the rings before we left to California. I convo’d the Jeremiah (shop owner) and told him what I wanted and how I had to have it before June 10th. I will say I didn’t always get an immediate response, which some expect. However, it never took more than 2 messages to get his attention. He was always helpful and polite in every exchange. He agreed upon the terms, and we bought the rings. The previous negative feedbacks did make me nervous. Well after impatiently waiting a few weeks, the rings arrived. I received them June 9th in an Express Envelope. I was so pleased! The rings are beautiful! The engravings are perfect! My wedding band is only 3MM, and you can still read Buffalo Gal clearly. You can see how much time and detail are put into these beautiful rings. I can say I would recommend this shop to others, which I have. And I would definitely shop there again.